Deputy Barney Fife: Andy, you can't let Otis go! Sherriff Andy Taylor: Well I have to, his sentence is up. Barney: But he's the only prisoner we got! Barney: Well, what are the state police going to think when they get here and find we got an empty jail? They're gonna think this is just a hick town where nothing ever happens! Andy: Well now, you got to admit, that is about the size of it. One of televisions most endearing sit-coms makes its way to DVD with The Andy Griffith Show, created by Danny Thomas, and first airing in the fall of 1960 after three of the central characters—Andy, Opie, and Aunt Bee—were introduced in the Danny Meets Andy Griffith episode of Make Room for Daddy (The Danny Thomas Show). 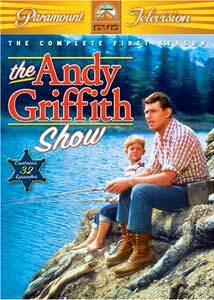 Among the first rural comedies produced in the 1960s, which also included the likes of Green Acres The Beverly Hillbillies and Petticoat Junction, The Andy Griffith Show would remain extremely popular during its eight-year run, never out of the top ten, and, in its final season, the number one spot. Paramount includes all 32 uncut first season episodes in this set. Griffith plays Andy Taylor, town sherriff, justice-of-the-peace, and a widower trying to raise his young son, Opie (Ron Howard), with the help of his Aunt Bee (Frances Bavier) in the small town of Mayberry, North Carolina. Mayberry is a quiet place, with not much in the way of law breaking other than Otis' (the town drunk) weekly visits, but that doesn't stop Andy's faithful cohort, the gung ho deputy (and Andy's cousin) Barney Fife (Don Knotts) from keeping an eye out for lawlessness. To Andy's fairly relaxed manner, Barney is extremely high strung to the point where he isn't allowed to carry a loaded side arm in case of accidental discharge. Andy has to cope with the eccentric personalities in his life and still have time for a song at the end of the day. Griffith is outstanding in his part, and contrary to my recollections of the show from years ago, his sherriff is no goody two shoes. He's prone to being sexist, a pro at manipulating his friends, bends the truth from time to time, and known to smoke on occasion. While his intentions are honorable, he also has a tendency to wield his authority in some rather unorthodox ways. These character traits are the heart of the series, with those around him able to point out his faults by recognizing them in others. Knotts is a show unto himself, bringing Barney's bewildering character to life. The scripting allows for Barney to swing from a delusionally heroic egotist to cowering baby in the course of a single scene, earning Knotts four Emmys for the role in the five years he was with the show, and another for his guest starring return in 1967. And who could forget little Ronny Howard (who of course went on to define Happy Days' Richie Cunningham before embarking on a celebrated directorial career), who expertly tackles the role of son Opie. No matter how funny any of the supporting cast are, where The Andy Griffith Show is at its finest is in the interplay between father and son. The writers take full advantage of the boy's perceptiveness at interpreting his father's guidance, with Andy's character flaws being called out time and again. Bavier's Aunt Bee provides the matronly duties, using her infinite wisdom to keep both father and son in line, but not without some insecurities of her own. The town of Mayberry has its share of interesting folk, among them Floyd, the barber, whose business serves as the hub of male gossip, the indecisive Mayor Pike, and Otis, who has his share of screen time trying to maintain his sobriety, or letting himself into his cell after a bender. The show does a great job of developing the characters. At first, both Andy and Barney are single, but they are both given love interests as the series progresses. Andy's Ellie (Elinor Donahue) arrives as the daughter of the pharmacist, a much younger girl, setting up a number of memorable episodes between the two of them (even though Donahue left the show after the first season on the basis that she didn't have any chemistry with Griffith), while Barney's Thelma Lou is only featured in a couple of episodes. The stories look at the pair from many angles, but always from a humorous viewpoint. The season opener is a wonderful introduction to Mayberry logic and especially the Opie-isms that frequent the show. With his former governess leaving to get married, Opie can't accept her replacement in Aunt Bee, but the boy's enthusiasm for her rapid departure is scullied when he learns how "helpless" Aunt Bee really is—she can't even hunt frogs or fish! This episode also includes a great wedding sequence setting up Andy and Opie's interpretations of correct social behavior. Andy has to prove himself in The Manhunt, when the state police arrive to track down a dangerous felon, but shun the local sherriff's participation, and he his hands full in Irresistible Andy when he comes to believe their are wedding bells in his future if he doesn't intervene. There are a couple of notable Barney showcases here, the first, Andy Saves Barney's Morale, finds an overzealous Barney cracking down on crime while Andy is away—resulting in the whole town being jailed, and Barney Gets His Man, where an unsuspecting Barney becomes the town hero after he captures a wanted felon who vows to get vengeance. Other noteable episodes include Alcohol and Old Lace, where the law is cracking down on moonshiners only to discover a pair of spinsters (who serve as the prototype for The Waltons' Baldwin sisters), harmlessly distilling the family recipe, and Andy and Opie, Housekeepers, which finds the men of the household trying to fare well while Aunt Bee is away—with hilarious consequences. Both Griffith and Knotts had originally signed on for a five-year run; however Griffith remained until the show's finish in 1968. The series spawned a pair of spinoffs with Griffith's departure, Mayberry R.F.D., and Gomer Pyle U.S.M.C., based on Jim Nabors' (who joined in the second season) character. Revisiting the series after all this time, The Andy Griffith Show still manages to entertain with its wholesome fun and loveable characters. Welcome to Mayberry! Image Transfer Review: Overall, the black-and-white image is impressive, though the quality does vary from episode to episode. Paramount appears to have used intact masters, as any quality changes affect the opening and closing credits as well. Many episodes look excellent, with a clean, crisp picture, great midtones and fine grain structure. The poorer-looking episodes have less definition, look softer, have too much contrast and a moderate number of defects in the print, but still look quite good. There are some interlacing artifacts throughout Irresistable Andy and A Plaque for Mayberry, and many episodes have some color interference in tight patterned areas, such as polka dot fabrics or tight weave plaids. Although the quality is not entirely consistent, these episodes still look a lot better than expected. Audio Transfer Review: Mono audio is clean and clear, with only the slightest traces of hiss on occasion. Dialogue is easy to discern, without any excess sibilance. Nothing to complain about in this department. Extras Review: There are no extras to speak of. While not menu accessable, there are five chapter stops within each episode, including one immediately following the opening credits. The original CBS television slug follows the end credits. The menus are basic, with direct access to each episode plus a Play All option. The discs come in four thinpak cases inside a sturdy cardboard slip cover. Each disc case features a synopsis for its episodes with original air dates and a trivia note inside. The Andy Griffith Show is wonderful for the whole family to enjoy. While some parts are a little dated, on the whole the entertainment value is high. And while the best of the show is yet to come, this first season holds a wealth of great episodes, and Paramount has given us a very nice presentation quality.